The issue of slavery proved especially combustible in the reform-minded antebellum United States. Those who hoped to end slavery had different ideas about how to do it. Some could not envision a biracial society and advocated sending blacks to Africa or the Caribbean. Others promoted the use of violence as the best method to bring American slavery to an end. Abolitionists, by contrast, worked to end slavery and to create a multiracial society of equals using moral arguments—moral suasion—to highlight the immorality of slavery. In keeping with the religious fervor of the era, abolitionists hoped to bring about a mass conversion in public opinion to end slavery. An early and popular “reform” to slavery was colonization, or a movement advocating the displacement of African Americans out of the country, usually to Africa. In 1816, the Society for the Colonization of Free People of Color of America (also called the American Colonization Society or ACS) was founded with this goal. Leading statesmen including Thomas Jefferson endorsed the idea of colonization. Members of the ACS did not believe that blacks and whites could live as equals, so they targeted the roughly 200,000 free blacks in the United States for relocation to Africa. For several years after the ACS’s founding, they raised money and pushed Congress for funds. In 1819, they succeeded in getting $100,000 from the federal government to further the colonization project. The ACS played a major role in the creation of the colony of Liberia, on the west coast of Africa. The country’s capital, Monrovia, was named in honor of President James Monroe. The ACS stands as an example of how white reformers, especially men of property and standing, addressed the issue of slavery. Their efforts stand in stark contrast with other reformers’ efforts to deal with slavery in the United States. Although rebellion stretches the definition of reform, another potential solution to slavery was its violent overthrow. Nat Turner’s Rebellion, one of the largest slave uprisings in American history, took place in 1831, in Southampton County, Virginia. Like many slaves, Nat Turner was inspired by the evangelical Protestant fervor sweeping the republic. He preached to fellow slaves in Southampton County, gaining a reputation among them as a prophet. He organized them for rebellion, awaiting a sign to begin, until an eclipse in August signaled that the appointed time had come. Turner and as many as seventy other slaves killed their masters and their masters’ families, murdering a total of around sixty-five people ([link]). Turner eluded capture until late October, when he was tried, hanged, and then beheaded and quartered. Virginia put to death fifty-six other slaves whom they believed to have taken part in the rebellion. White vigilantes killed two hundred more as panic swept through Virginia and the rest of the South. 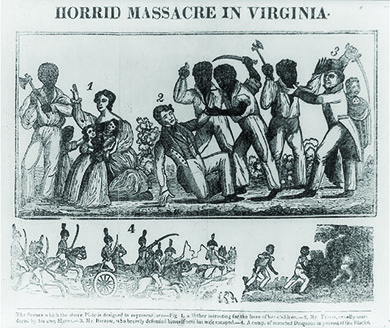 In Horrid Massacre in Virginia, circa 1831, the text on the bottom reads, “The Scenes which the above plate is designed to represent are Fig 1. a mother intreating for the lives of her children. -2. Mr. Travis, cruelly murdered by his own Slaves. -3. Mr. Barrow, who bravely defended himself until his wife escaped. -4. A comp. of mounted Dragoons in pursuit of the Blacks.” From whose side do you think the illustrator is telling this story? Thomas R. Gray was a lawyer in Southampton, Virginia, where he visited Nat Turner in jail. He published The Confessions of Nat Turner, the leader of the late insurrection in Southampton, Va., as fully and voluntarily made to Thomas R. Gray in November 1831, after Turner had been executed. For as the blood of Christ had been shed on this earth, and had ascended to heaven for the salvation of sinners, and was now returning to earth again in the form of dew . . . it was plain to me that the Saviour was about to lay down the yoke he had borne for the sins of men, and the great day of judgment was at hand. . . . And on the 12th of May, 1828, I heard a loud noise in the heavens, and the Spirit instantly appeared to me and said the Serpent was loosened, and Christ had laid down the yoke he had borne for the sins of men, and that I should take it on and fight against the Serpent, . . . Ques. Do you not find yourself mistaken now? Ans. Was not Christ crucified. And by signs in the heavens that it would make known to me when I should commence the great work—and on the appearance of the sign, (the eclipse of the sun last February) I should arise and prepare myself, and slay my enemies with their own weapons. Nat Turner’s Rebellion provoked a heated discussion in Virginia over slavery. The Virginia legislature was already in the process of revising the state constitution, and some delegates advocated for an easier manumission process. The rebellion, however, rendered that reform impossible. Virginia and other slave states recommitted themselves to the institution of slavery, and defenders of slavery in the South increasingly blamed northerners for provoking their slaves to rebel. Literate, educated blacks, including David Walker, also favored rebellion. Walker was born a free black man in North Carolina in 1796. He moved to Boston in the 1820s, lectured on slavery, and promoted the first African American newspaper, Freedom’s Journal. He called for blacks to actively resist slavery and to use violence if needed. He published An Appeal to the Colored Citizens of the World in 1829, denouncing the scheme of colonization and urging blacks to fight for equality in the United States, to take action against racism. Walker died months after the publication of his Appeal, and debate continues to this day over the cause of his death. Many believe he was murdered. Walker became a symbol of hope to free people in the North and a symbol of the terrors of literate, educated blacks to the slaveholders of the South. Abolitionists took a far more radical approach to the issue of the slavery by using moral arguments to advocate its immediate elimination. They publicized the atrocities committed under slavery and aimed to create a society characterized by equality of blacks and whites. In a world of intense religious fervor, they hoped to bring about a mass awakening in the United States of the sin of slavery, confident that they could transform the national conscience against the South’s peculiar institution. I am aware that many object to the severity of my language; but is there not cause for severity? I will be as harsh as truth, and as uncompromising as justice. On this subject, I do not wish to think, or speak, or write, with moderation. No! No! Tell a man whose house is on fire to give a moderate alarm; tell him to moderately rescue his wife from the hands of the ravisher; tell the mother to gradually extricate her babe from the fire into which it has fallen;—but urge me not to use moderation in a cause like the present. I am in earnest—I will not equivocate—I will not excuse—I will not retreat a single inch—AND I WILL BE HEARD. White Virginians blamed Garrison for stirring up slaves and instigating slave rebellions like Nat Turner’s. Garrison founded the New England Anti-Slavery Society in 1831, and the American Anti-Slavery Society (AASS) in 1833. By 1838, the AASS had 250,000 members, sometimes called Garrisonians. They rejected colonization as a racist scheme and opposed the use of violence to end slavery. Influenced by evangelical Protestantism, Garrison and other abolitionists believed in moral suasion, a technique of appealing to the conscience of the public, especially slaveholders. Moral suasion relied on dramatic narratives, often from former slaves, about the horrors of slavery, arguing that slavery destroyed families, as children were sold and taken away from their mothers and fathers ([link]). Moral suasion resonated with many women, who condemned the sexual violence against slave women and the victimization of southern white women by adulterous husbands. 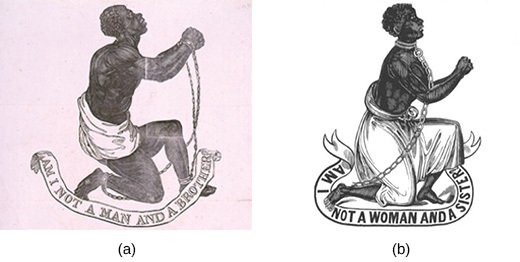 These woodcuts of a chained and pleading slave, Am I Not a Man and a Brother? (a) and Am I Not a Woman and a Sister?, accompanied abolitionist John Greenleaf Whittier’s antislavery poem, “Our Countrymen in Chains.” Such images exemplified moral suasion: showing with pathos and humanity the moral wrongness of slavery. What imagery and rhetoric does Whittier use to advance the cause of abolitionism? Garrison also preached immediatism: the moral demand to take immediate action to end slavery. He wrote of equal rights and demanded that blacks be treated as equal to whites. He appealed to women and men, black and white, to join the fight. The abolition press, which produced hundreds of tracts, helped to circulate moral suasion. Garrison and other abolitionists also used the power of petitions, sending hundreds of petitions to Congress in the early 1830s, demanding an end to slavery. Since most newspapers published congressional proceedings, the debate over abolition petitions reached readers throughout the nation. Although Garrison rejected the U.S.
political system as a tool of slaveholders, other abolitionists believed mainstream politics could bring about their goal, and they helped create the Liberty Party in 1840. Its first candidate was James G. Birney, who ran for president that year. Birney epitomized the ideal and goals of the abolitionist movement. Born in Kentucky in 1792, Birney owned slaves and, searching for a solution to what he eventually condemned as the immorality of slavery, initially endorsed colonization. In the 1830s, however, he rejected colonization, freed his slaves, and began to advocate the immediate end of slavery. The Liberty Party did not generate much support and remained a fringe third party. Many of its supporters turned to the Free-Soil Party in the aftermath of the Mexican Cession. The vast majority of northerners rejected abolition entirely. Indeed, abolition generated a fierce backlash in the United States, especially during the Age of Jackson, when racism saturated American culture. Anti-abolitionists in the North saw Garrison and other abolitionists as the worst of the worst, a threat to the republic that might destroy all decency and order by upending time-honored distinctions between blacks and whites, and between women and men. Northern anti-abolitionists feared that if slavery ended, the North would be flooded with blacks who would take jobs from whites. Opponents made clear their resistance to Garrison and others of his ilk; Garrison nearly lost his life in 1835, when a Boston anti-abolitionist mob dragged him through the city streets. Anti-abolitionists tried to pass federal laws that made the distribution of abolitionist literature a criminal offense, fearing that such literature, with its engravings and simple language, could spark rebellious blacks to action. Their sympathizers in Congress passed a “gag rule” that forbade the consideration of the many hundreds of petitions sent to Washington by abolitionists. A mob in Illinois killed an abolitionist named Elijah Lovejoy in 1837, and the following year, ten thousand protestors destroyed the abolitionists’ newly built Pennsylvania Hall in Philadelphia, burning it to the ground. Many escaped slaves joined the abolitionist movement, including Frederick Douglass. Douglass was born in Maryland in 1818, escaping to New York in 1838. He later moved to New Bedford, Massachusetts, with his wife. Douglass’s commanding presence and powerful speaking skills electrified his listeners when he began to provide public lectures on slavery. He came to the attention of Garrison and others, who encouraged him to publish his story. In 1845, Douglass published Narrative of the Life of Frederick Douglass, An American Slave Written by Himself, in which he told about his life of slavery in Maryland ([link]). He identified by name the whites who had brutalized him, and for that reason, along with the mere act of publishing his story, Douglass had to flee the United States to avoid being murdered. This 1856 ambrotype of Frederick Douglass (a) demonstrates an early type of photography developed on glass. Douglass was an escaped slave who was instrumental in the abolitionism movement. 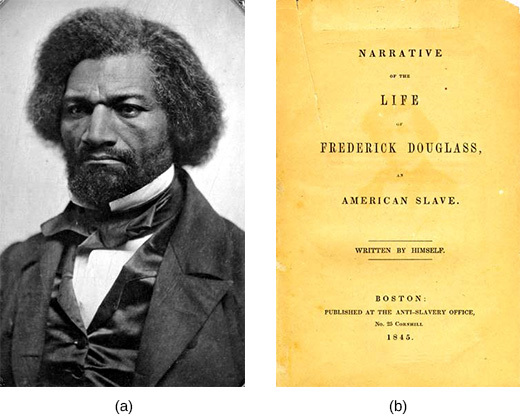 His slave narrative, told in Narrative of the Life of Frederick Douglass, An American Slave Written by Himself (b), followed a long line of similar narratives that demonstrated the brutality of slavery for northerners unfamiliar with the institution. British abolitionist friends bought his freedom from his Maryland owner, and Douglass returned to the United States. He began to publish his own abolitionist newspaper, North Star, in Rochester, New York. During the 1840s and 1850s, Douglass labored to bring about the end of slavery by telling the story of his life and highlighting how slavery destroyed families, both black and white. Most white slaveholders frequently raped female slaves. In this excerpt, Douglass explains the consequences for the children fathered by white masters and slave women. Slaveholders have ordained, and by law established, that the children of slave women shall in all cases follow the condition of their mothers . . . this is done too obviously to administer to their own lusts, and make a gratification of their wicked desires profitable as well as pleasurable . . . the slaveholder, in cases not a few, sustains to his slaves the double relation of master and father. . . . Such slaves [born of white masters] invariably suffer greater hardships . . . They are . . . a constant offence to their mistress . . . she is never better pleased than when she sees them under the lash, . . . The master is frequently compelled to sell this class of his slaves, out of deference to the feelings of his white wife; and, cruel as the deed may strike any one to be, for a man to sell his own children to human flesh-mongers, . . . for, unless he does this, he must not only whip them himself, but must stand by and see one white son tie up his brother, of but few shades darker . . . and ply the gory lash to his naked back. What moral complications did slavery unleash upon white slaveholders in the South, according to Douglass? What imagery does he use? Contrasting proposals were put forth to deal with slavery. Reformers in the antebellum United States addressed the thorny issue of slavery through contrasting proposals that offered profoundly different solutions to the dilemma of the institution. Many leading American statesmen, including slaveholders, favored colonization, relocating American blacks to Africa, which abolitionists scorned. Slave rebellions sought the end of the institution through its violent overthrow, a tactic that horrified many in the North and the South. Abolitionists, especially those who followed William Lloyd Garrison, provoked equally strong reactions by envisioning a new United States without slavery, where blacks and whites stood on equal footing. Opponents saw abolition as the worst possible reform, a threat to all order and decency. Slaveholders, in particular, saw slavery as a positive aspect of American society, one that reformed the lives of slaves by exposing them to civilization and religion. In the context of the antebellum era, what does colonization refer to? Which of the following did William Lloyd Garrison not employ in his abolitionist efforts? Addressing Slavery by OpenStaxCollege is licensed under a Creative Commons Attribution 4.0 International License, except where otherwise noted.